We’re moving right along through our alphabet book and up next is the uppercase letter D! 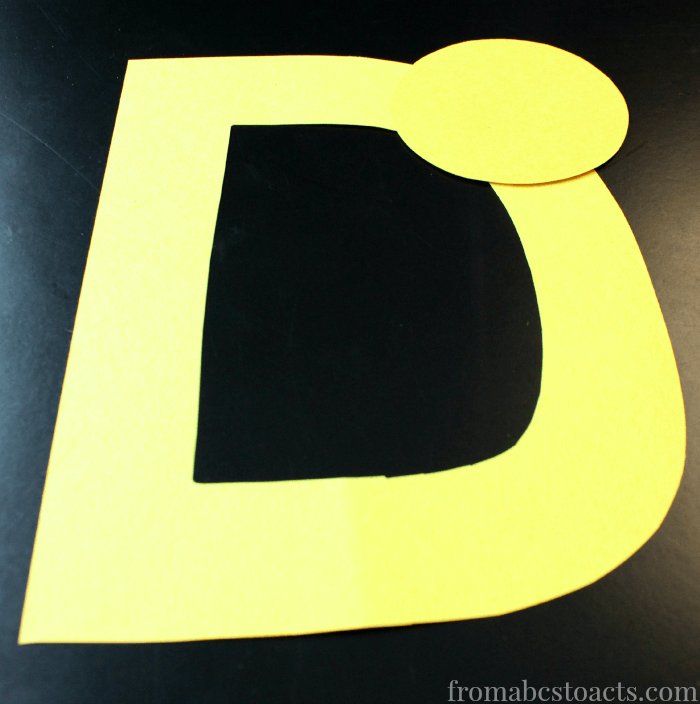 An adorable and super easy to make letter D duck that is! I mean really, how cute is this guy?! And of course, the materials you need to make him are super simple as well! In fact, you probably already have everything you need at home! First up, you’ll need to either cut out your pieces or have your child do it if they’re old enough for scissors. From the yellow sheet of construction paper, cut out a large uppercase letter D, a circle for the head, and a rain drop shape for the wing. From your orange sheet of construction paper, you’ll need to cut out 2 feet and a heart shape that will be used for the beak of your duck. Once your pieces are all cut out, you can’t start assembling your duck. For this craft, we found that it was a lot easier to assemble our duck first and then glue the whole thing onto the card stock rather than gluing onto the card stock as we went. To begin assembling your duck, grab the yellow circle that you just cut out and glue it on to your yellow letter D right up top. This will make your duck’s head. Glue the wing onto the straight line section of your letter D and the feet onto the bottom. With the feet, you’ll want to glue them to the backside of your letter so that you won’t see all of the extra once you glue him onto the card stock. For the head, add some googly eyes and your beak (by gluing the heart shape sideways) and you’re all done! Glue the whole thing onto your card stock and whole punch it for your alphabet notebook! Isn’t he cute?! One more super cute critter added to our book! To extend your letter D learning, grab the Uppercase Letter D printable page below and enjoy!